Just over a week ago I spent a few days chilling out near Bristol with Amy. One day when she was working I went out on the hunt for my climbing fix local crags. I found a wicked little crag called Burton Combe less than a mile for her house. I spent an enjoyable couple of hours working out the moves. I spent today work on the auxiliary battery control electrics and making a start on the shelving units. 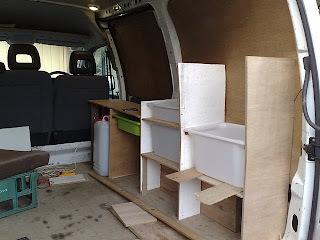 The hardest part has been the fact the no single panel, floor or wall in the van in level or straight!